This is a sponsored post. Tropical Smoothie provided me with gift cards for my own personal use and to giveaway in exchange for this review. All opinions are my own. Tropical Smoothie Cafe is making some changes. And I was part of a group of bloggers and social media mavens to see (and sample!) 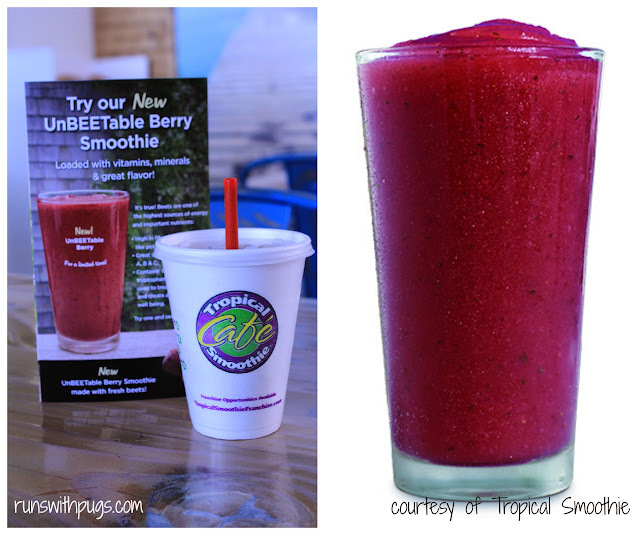 some of the new things and tastes that the crew at Tropical Smoothie Cafe has blended up. With Kristin from A Mom on the Run, ready for a morning of sampling. We were invited out to the newest Tropical Smoothie Cafe location in Middleburg. When we walked into the store, I was thoroughly impressed by how bright and fresh the new decor was. Tropical Smoothie Cafe CEO Mike Rotondo, our host for the morning, explained that he felt it was time to make Tropical Smoothie locations more of a destination to dine in, rather than grab-and-go. As a result, the new and improved store model showcases an actual smoothie bar and open kitchen. All drinks and dishes are created right in front of the customers, producing a new, more comfortable, vibe for the establishment. There are some other changes in the works. For one thing, there will no longer be soda machines in Tropical Smoothie Cafes. Instead, offerings will add an assortment of fresh lemonades and teas to the menu, to supplement the smoothies and water offered as beverages. We got a taste of one of the lemonades and it was lovely: crisp and not too sweet. It was time to start tasting. First, the smoothie “bartender” made us a sample of their most popular product: “Island Green”, (a blend of spinach, kale, mango, pineapple and banana). It was a great example of how vegetables, especially greens, can also be part of a yummy drink. I confess that I have never had a green smoothie of any kind, and I was surprised at home much I enjoyed it. 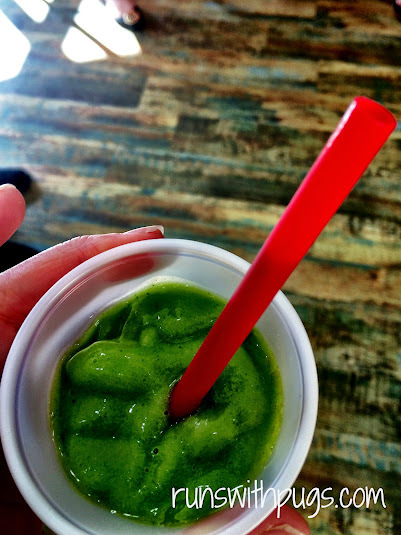 I do love green veggies and eat a lot of them, but the idea of having them blended up in a frozen concoction always gave me pause. Next up was the all new UnBEETable Berry. I’m a pretty big beet lover. My great grandmother made the world’s most delicious pickled beets and I will always load up on beets in salads. That being said, I was pretty interested to see how a beet-infused smoothie was going to go. The UnBEETable Berry is a combination of fresh beets (skins and all), strawberries, blueberries, banana and cranberries. There was a definite earthiness to the flavor. It wasn’t unpleasant, but a little different. However, after a few sips, the tart crispness of the cranberries caught up, with just a hint of sweetness from the berries, making the whole thing quite refreshing and delicious. I would definitely order this on my own. Mr. Rotondo spoke at length about the processes involved in getting just the right flavor and texture combinations, especially when it came to using vegetables. With that, we were offered a taste of the Totally Green smoothie. This is a slightly less popular item than the Island Green, featuring cucumber, green apple, kale, spinach, celery and kiwi. I loved it. It didn’t have the (to-me) sweetness of the Island Green, but the flavors were incredibly fresh and clean. I loved the hint of celery and green apple peeking through, and I never would have known kiwi was included (not a kiwi fan). 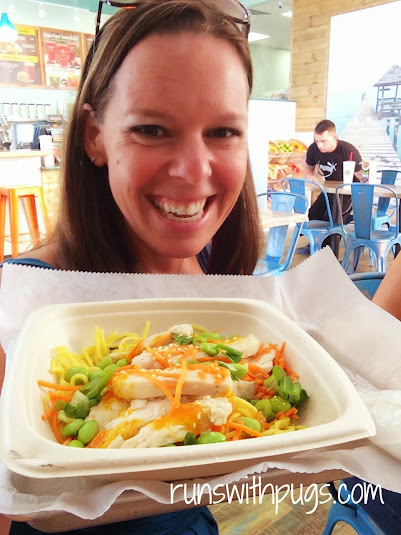 After our smoothie sampling, we were invited to sit down for the next “course”: noodle bowls! 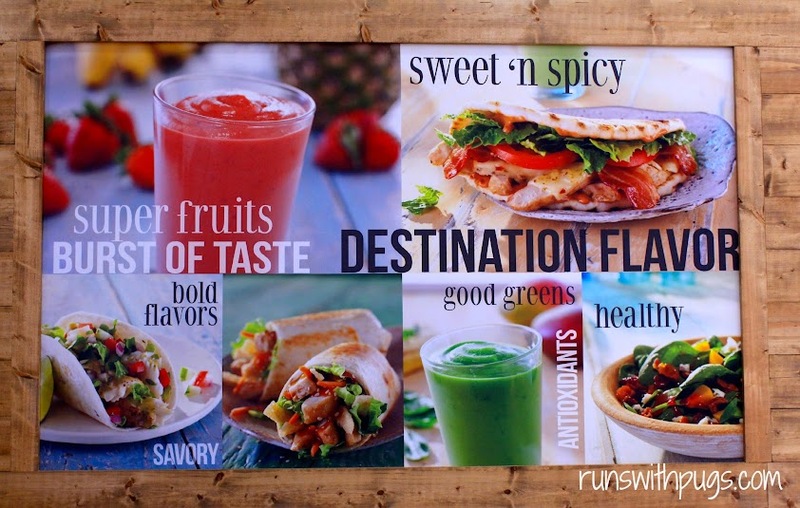 Tropical Smoothie Cafe regularly tweaks its menu, substituting less popular items with new offerings, in an attempt to keep everything up to date and enjoyable. Noodle bowls are currently available as a limited time offer in two varieties: Spicy Mongolian Steak and Ginger Miso Chicken. Grilled chicken, edamame, shredded carrots, scallions, cucumber, sesame seeds and noodles sit atop a bed of baby spinach, dressed in a Carrot Ginger Miso Sauce. The dish was light enough for lunch in a hot Florida summer, but satisfying as well. I loved the crunch of the fresh veggies with the warm noodles and chicken, and the flavors worked well together. The spicy Mongolian Steak was also delicious. I don’t often eat red meat, and the noodle bowl can be customized with a different protein (chicken or a vegetarian option) if desired, but this was probably my favorite. 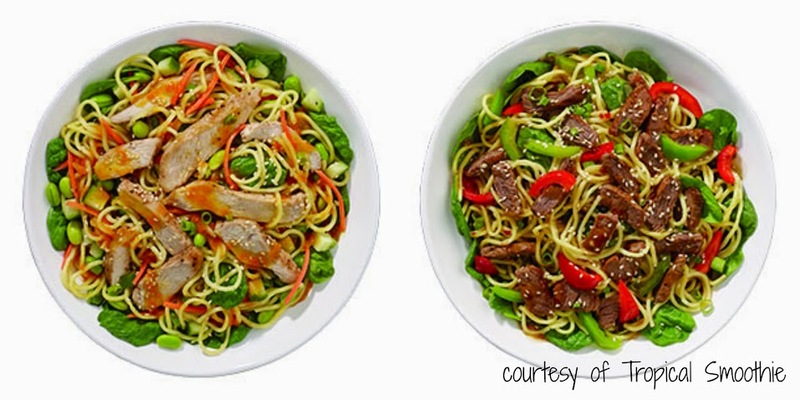 Sliced, marinated steak is tossed with green and red peppers, scallions, sesame seeds, noodles and a Spicy Asian BBQ sauce on the same bed of noodles. I am a big fan of spicy, things, and this was definitely a hearty dish, perfect as comfort food. I’m excited to see how Tropical Smoothie Cafe continues innovating and developing along the way. Stan, Kristin, Tropical Smoothie Cafe CEO Mike Rotondo, me and Daisy at Middleburg’s new Tropical Smoothie Cafe. 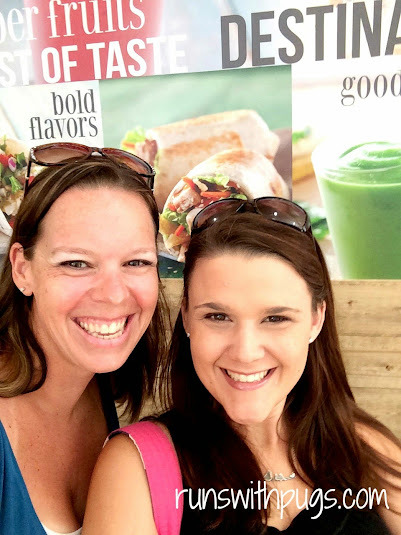 After sharing all the tempting deliciousness from our special morning, I am thrilled to be able to offer a $25 Tropical Smoothie Gift card to one lucky reader! There are lots of ways to enter for your chance to win, so don’t be shy. Giveaway ends at midnight ET on Sunday, August 31. Good luck! WHY don’t they have this where I live?! I want the noodle bowls (yes both) and the second green smoothie in my belly RIGHT NOW. Yum! There used to be a Tropical Smoothie Café I LOVED right near my house, I need to start going again. I really like the Island green and would like to try the new blends. They already removed the Totally Green from the menu here, which I liked better than the Island Green. Beets have never been a favorite but it’s interesting to discover how veggies translate into a smoothie. Can’t wait to try! I’m not crazy about beets but I do love tropical smoothie! My favorite item is the chicken pesto flatbread with a paradise point smoothie. 🙂 yum!